It’s a struggle to pay your bills. Anxiety, math phobia, and paperwork challenges all add up to ADHD bill paying problems. Financial documents are a nightmare because of details, multiple steps and lack of consistency. Not to mention those awful accruing late fees! 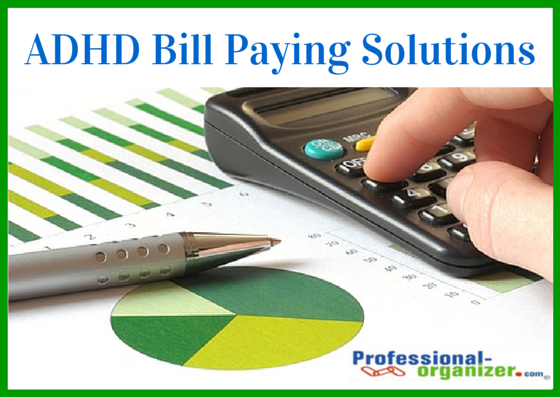 Try one of these ADHD bill paying solutions. Gather together your bills, a pencil, calculator, stamps, envelopes, checks and manilla envelopes. Open the envelopes of all the bills and mark the date due on each. Divide the bills to pay according to the date due and the income in your checkbook. Keep your bill paying center where you see it every day. Pay your bills either every day or 7 days ahead of due date. Set up online bill pay using your bank’s services. You will need one bill from each utility, including your account number. Open your bills each day and write the due date on the envelope. Pay your bills daily and set the due date for payment according to your balance and income. Set up your binder with tabbed slash pockets. Label the pockets: To be paid, January, February, March, etc. 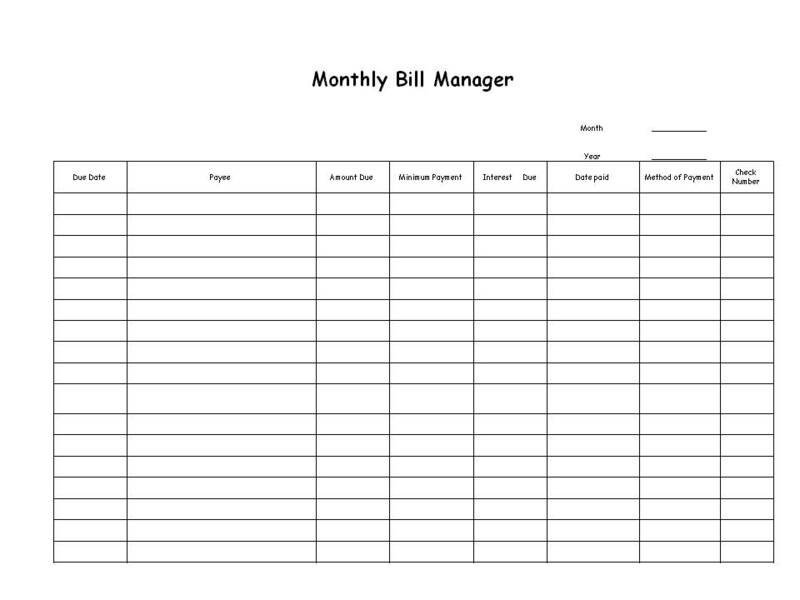 Use this Monthly Bill Manager to list your bills and how you paid. Place all bills in the binder as they arrive. Write checks and pay online once a week. Call the day Money Monday or Financial Friday. Set a reminder or put post it notes to help you stay on top of your weekly commitment. Keep the binder in the same place all the time so you can drop in bills and keep up with your weekly payments. There may be some payments that happen automatically from your account. Make a list of these payments and the amounts taken out monthly. It creates a visual reminder for you and keeps you on track with your money. Even with a great system, big surprises happen. Make a list of the big bills you pay at different times during the year. Payments for property tax, insurance, and estimated tax payments occur at random times throughout the year. Go back through last year’s checkbook and create a list of these expenses. Add these to your recurring reminders. What solutions work for your bill paying? More bill paying ideas here! Join my newsletter for oodles of organizing and productivity ideas. 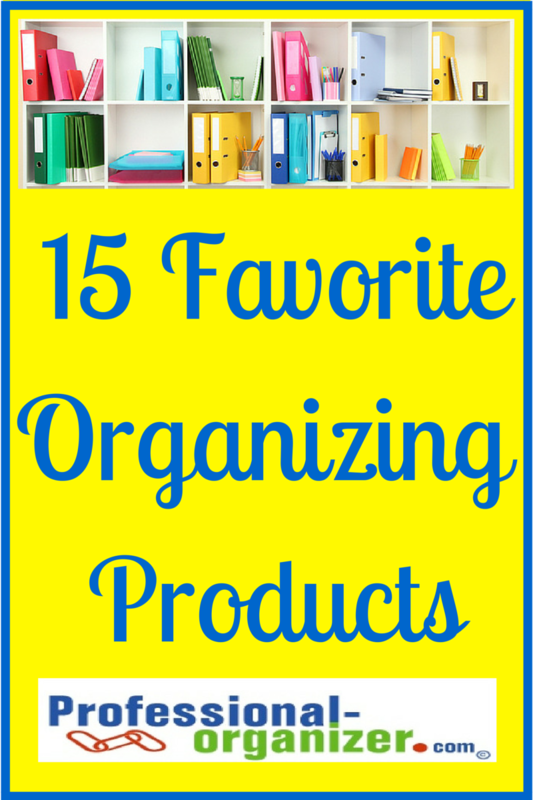 There are so many organizing products available everywhere. It can be confusing and overwhelming. It’s about size, proportion, color, clear and so many more choices. In addition you probably have a lot of organizing products at your home that you can reuse like baskets, bins or even shoe boxes. I put together this list of favorite organizing products to share some basic products that I love and that make a difference for you! This shoe organizing grid works wonders under your short hang items. You can put this at the back door to create a faux mud room. It’s great for kids shoes in their closets too. 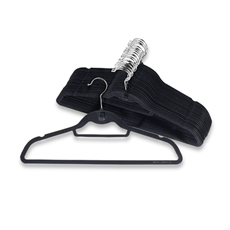 Not a luxury anymore, these slim line hangers are a necessity to organize your closet. Your clothes all hang at the same height. It makes your closet look like Neiman Marcus! Some times a little extra drawer space or a cart can add storage in an area. Three drawer carts give you space to categorize too. This cart can be used in the kitchen to store kids’ art supplies. 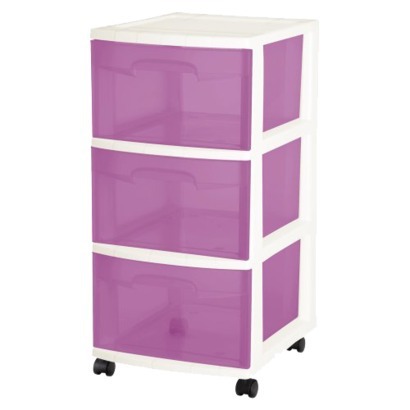 It can be used in your kids’ toy area to store dollies, dolly dresses and dolly accessories. It can be used in your kid’s closet for undies, jammies and leggings. Need an extra hook for a backpack or purse? Want to add a hooks on a bathroom door? 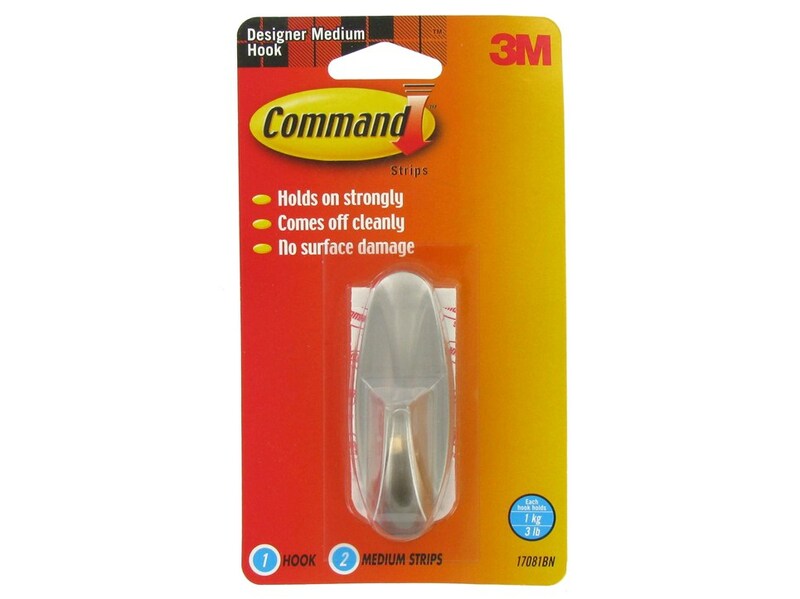 Here are command hooks to the organizing rescue! Portable plastic shelving helps you take advantage of vertical space. You can use this in an attic, basement, garage or under the stairs closet. It can be 3 to 5 shelves tall. You can use several side by side. It takes organizing to new heights. Inexpensive cube storage from IKEA makes it easy to organize. Using this product, you have ample storage that can be used creatively and functionally. 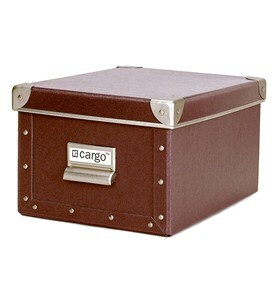 It can be used in an office, kid’s room, toy room, or any space that needs additional storage. Check out the many different uses here on my pinterest page. We never have enough kitchen storage. 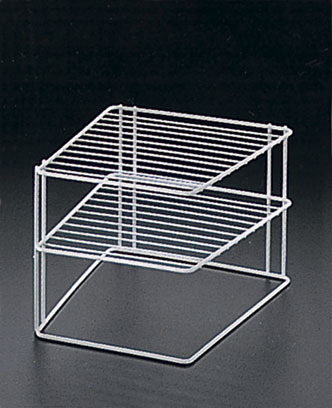 It’s great to add this shelf helper to store dishes in your cabinets where it’s not adjustable. This versatile product can be used over and over in your home. It can store floppy spice packets in the pantry, toys in the play room, school supplies in the office and more. Be sure to label the top and 2 sides to maintain your organization. 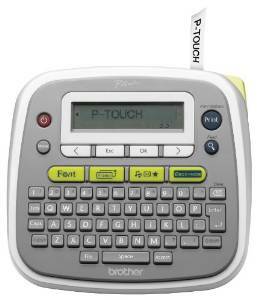 Our lives are better with a label maker! You can use these throughout your home and office to be sure everyone, including you, knows where things belong. It’s easiest to file when you have your files nearby. 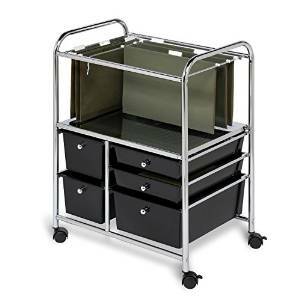 Add great file organization with a cart. We have fewer and fewer cds or disks to store, however offfice media storage makes an attractive. You can use this for music, photos or operations disks. A desk top sorter is the best paper command center. These attractive organizing products make it easy to drop in papers and retrieve when you need them, keeping your desk clear and functional. Taking your work on the road? 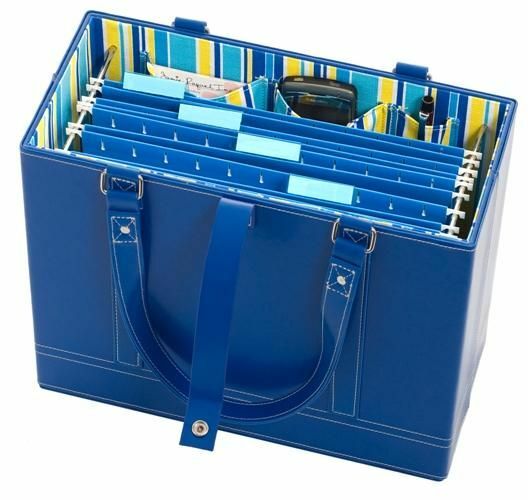 This paper organizing tote (from Office Candy) makes it easy to stay organized on the go. This elephant makes your life more productive. 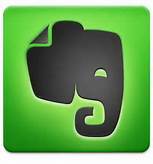 Evernote is an online tool to keep lists, tag websites, and more. It’s an app for all your devices. 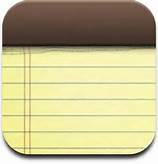 Simple to use, this Note on your smart phone gives you a post it note wherever your phone is! Planner pad is a designed to consolidate your lists and your planner. This planner helps you keep your life organized with slots for your lists, slots for your daily list and slots for your appointments. It’s unusual features make it a favorite for those with ADHD. That’s a wrap up of my favorites! Here’s more! What are your favorite organizing products? Love organizing products? Join my newsletter to see new ones each month! It’s quite funny but in southeast Texas we have no underground basements. The same applies to southeast Louisiana. Due to the water table in Houston, our “Texas basement” is storage above the garage. (In other parts of the country this is called the attic!) It can be accessed by a pull down ladder or through a door. No matter where your basement is located, Texas or not, some of the same organizing strategies apply! 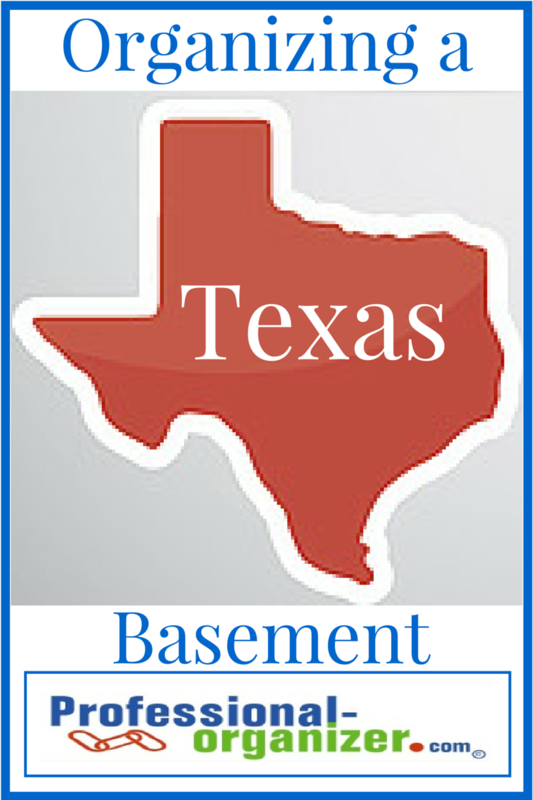 Organizing a Texas basement is the same as other basements. It’s always best to work in a partnership with a big space. Your Texas basement can be overwhelming otherwise. Choose a partner that helps you make good decisions about your stuff. Your partner could be the owner of some of the stuff or just help you reflect on whether it can be donated. Have a conversation ahead of time about priorities and what help you need to make decisions. It’s also great to have another set of hands to help move your boxes and bins together. It helps offset accidental injury. Set a date on the calendar that can’t be changed, no matter what. Get your partner and get going partner! There’s always lots of wall space in our Texas basements. 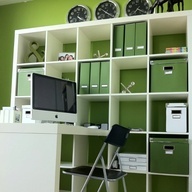 Use this vertical space well by adding storage with shelves. Using these inexpensive, 4 or 5 shelf units in your basement or attic gives you loads of additional storage. You can stack bins on them, store luggage on them, or even place large holiday decorations on them. 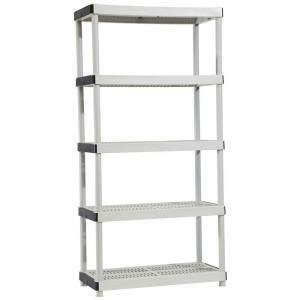 Line up 3 or 4 shelving units for maximum storage. Since these are light weight and portable these are a great asset for your space. Use plastic bins to contain your goods. Here in Texas we have a lot of big insects! We like to protect our goods by keeping them stored in plastic bins, rather than cardboard boxes. Cardboard attracts bugs and we want to be sure our items are secured away from bug stuff. 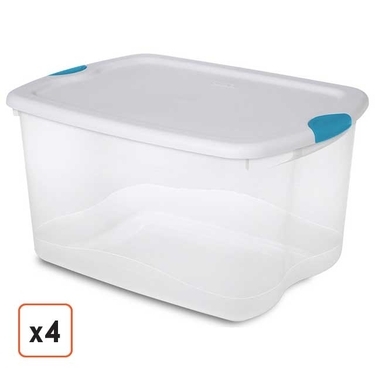 These 66 quart bins with a latch make it easy to carry your stuff up those stairs to your Texas basement. It’s not too big or heavy. It’s best to label two sides and the top of your bin to know what you are storing. Because we have limited storage, we need to make good decisions about what to store. In Texas the heat is definitely a factor in what to store in our Texas basements. With temperatures in the 90s during the summer, you want to store only items that can withstand that heat. Our Texas basements make it especially hard to store furniture. But that can be a blessing in disguise. Your furniture can be donated to a local furniture bank or homeless shelter where families are setting up their new homes. It helps us make good decisions on what to keep and helps us bless others with our donations. Whether it’s your basement or attic, be sure to check regularly for “unwanted guests”. Pests can get into your space and ruin what you are storing. Remember that this storage, like all other spaces in your home, needs a regular review of what’s being stored here. 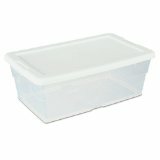 Date your boxes and bins so that you can check in a year or two whether you need the items. Treat your storage space like all other valuable space in your home. What do you store in your attic or basement? https://professional-organizer.com/WordPress/wp-content/uploads/2016/07/logo.png 0 0 Ellen https://professional-organizer.com/WordPress/wp-content/uploads/2016/07/logo.png Ellen2015-02-15 07:43:212015-02-15 07:43:56Organizing a "Texas Basement"
Professional organizers and productivity consultants were just beginning to be recognized as resources to help you at home and work. Clutter was not recognized as one of the top 3 resolutions for making change in our lives each year. What I love about my work is the mutual trust, respect and joy of my work with my clients. My clients are brilliant people who organizing has eluded their lives. I have learned so much from my clients over the last 15 years. Here’s what we have shared over the years. Our work together has many emotions. There’s tears and laughter and anxiety and hope. There are many emotions in our work. Working together it’s more than the stuff. It’s how we feel as we approach organizing and where we are in our lives too. What’s most powerful about our work is the positivity that comes from it. When we work together, clients feel empowered and positive about organizing and productivity. It starts with feeling successful and trickles over to all parts of their lives. There’s always a hug at the end! There’s lots to talk about. More than anything, there’s lots to communicate about when organizing. Every item has a story behind it. Our stuff is linked to experiences, people, and feelings. Our stories help us let go of or value our stuff. We do a lot of talking and processing about our stuff to let it go. Many of my clients are verbal processors. As they talk through a situation, it becomes clearer to them. In their heads there was a lot of clutter too. Verbalizing and talking helps them focus and find clarity. Talking through a decision helps my clients. When they are paralyzed by indecision, we work together to bring about clarity. We work best with a partner. Organizing can be isolating, scary and sad. Working with a partner brings energy and positivity to the work. A second set of eyes, hands and feet make the work load much easier. When we are sitting together going through paper, having another person there to help with decisions makes it easier. Having a partner makes every situation less stressful and less of a work load. When I arrive, we are committed to our work that day. It lifts the burden for my clients. It brings energy to our work to have add a partner. Many of my clients were highly organized and then “life happened.” There are many complicated situations that brought about disorder. Taking time to catch up can restore confidence and peace of mind. We have high expectations of ourselves. It’s hard to stay organized during a health crisis, a family crisis, or a combination. We often think we can do more in the time we have or with the energy left after a crisis. I often hear from my clients that they were organized and then they lost a parent they cared for in their home. I also learn that they are managing the paper work and possessions of several family members. With my being a part of the team, they are able to restore order to their lives. They feel capable and competent going forward. Everyone has a different organizing style. 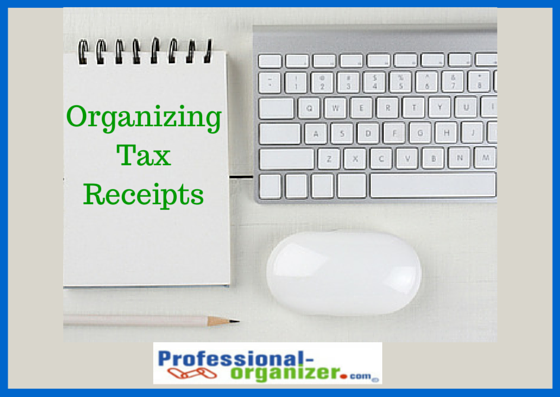 Many of my clients have never been organized. It was never their strength. It was never how they thought. I love helping them create their own style of organization by our work together. There is no one “right” way to be organized. There are many levels of organization, from minimalist to Martha. What works for you is what’s most valuable. 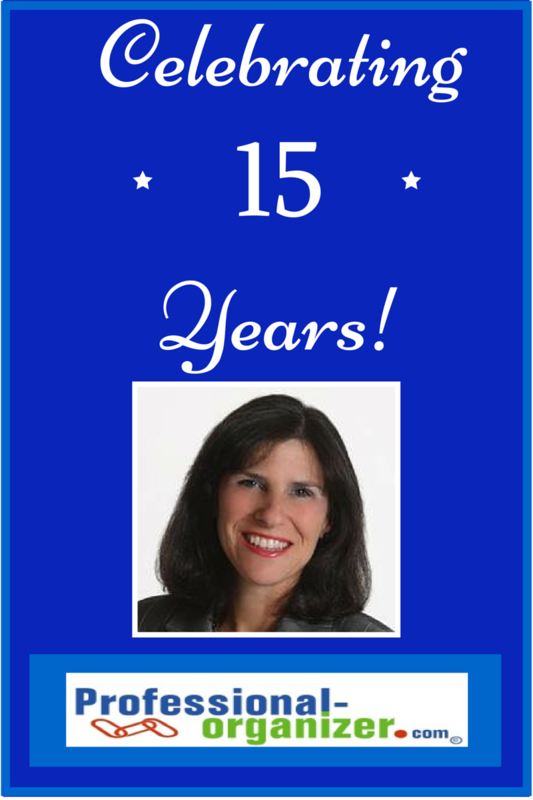 I am planning on another 15 years of organizing and productivity consulting. It’s remarkable to work as a team and I am excited to be a witness to the transformations I see every day. You can see them too by checking out Hugs and Happy Organizing, true stories and pictures of my work with clients. I always sign off with hugs and happy organizing too! Our small businesses require 24/7 computer access. There’s nothing more troubling than computer challenges. Check out these tips in collaboration with Lisa Margetis. She is sharing about keeping your computer cleaned up and ready at all times. 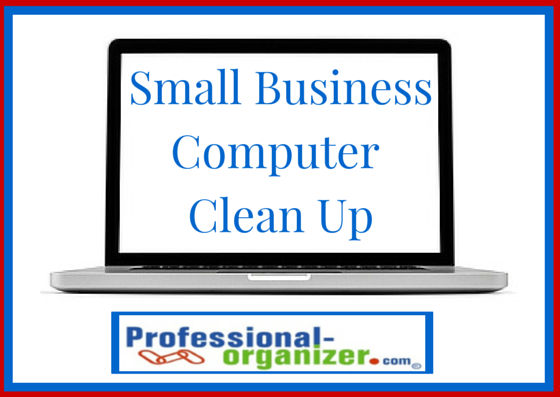 What’s the best way to get started “cleaning up your computer” for a small business? 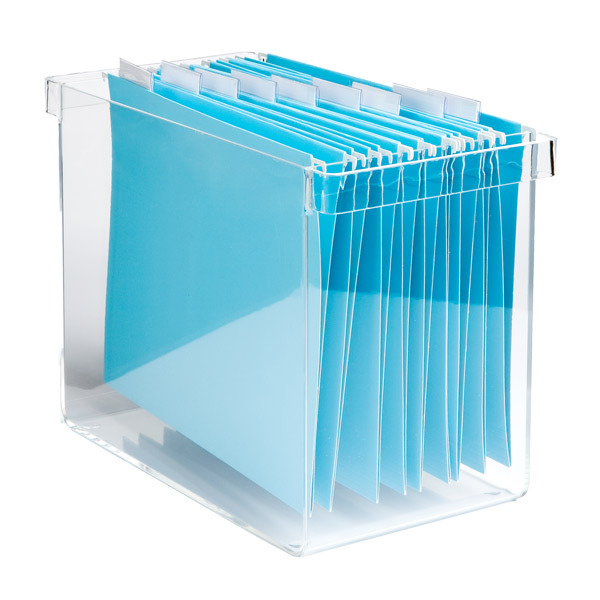 The best way to start getting business files organized is to create and implement a style of folder organization that is easy-to-follow for both you and your employees. If you can create an accompanying training guide as well, this will be very helpful in keeping all of your organization’s files consistent across the company. It’s also important to enable network sharing settings for employees who may need to access files that don’t live on their hard drive. However, an alternative option would be to use a collaborative document system that lives in the cloud (such as Google Drive) so that all employees can access any documents at any time from anywhere. Google Drive is great because it also allows you to share documents with individuals both inside and outside of your organization at your discretion. What steps do you take to organize information on your computer? Personally, I use an organization system that organizes by project I am working on. For example, when creating this calendar, I have my files organized with the prefix CCC (for Clean Computer Calendar) followed by a bar symbol (|) and then whatever the document is about. Some example file names are: ‘CCC | Calendar Draft’, ‘CCC | Calendar Copy FINAL’, ‘CCC | Finished JPG’, etc. This way, all items from a given project are grouped together which makes it easier to find items in the long run. I often create a folder for a given project once it is complete so that my ‘Documents’ folder only contains items that I am currently working on. Likely in a few months’ time I will create a folder labeled “Clean Computer Calendar” and put all of my items labeled with ‘CCC’ into it. My folder system words so that it would be located in Documents>Projects>Clean Computer Calendar. I try to use a system that any coworker could understand if they were looking for something on my computer. What’s one thing that all small business owners should do to maintain security on their computer? The best way to maintain security is to do two things. • Make sure to always be updating your system, as well as any antivirus or firewall software you have installed. Although it can be tedious and annoying when an alert pops up that your computer needs updating, it is extremely important to take the time to install these updates, as they are often being released to help combat some sort of security feature that will help protect your system. • Make sure to use unique passwords and update them regularly. Personally, I try to rotate my passwords every two months. Again, this probably seems tedious and annoying, but it helps safeguard your system. It’s important to note that these passwords shouldn’t just change incrementally (ex: ilovemydog1, ilovemydog2, ilovemydog3, etc.) and instead are completely different each time they are changed (ex: ilovemydog1, catsrule23, mynameislisa14, etc). If you can avoid using dictionary words, that’s even better, as the more difficult you make your password, the less likely it is that a robot could crack the code. What suggestions do you have for backing up computers for small business? It is so important in today’s technology age to be backing up all the time and in different locations. For small businesses, I would definitely recommend backing up to a dedicated cloud server for your business, and doing so in a location that isn’t close to where you are headquartered. This is called co-location, which is the practice of backing up your data in multiple locations. This way, if a disaster happens (fire, flood, etc.) at your headquarters, your data is safely housed somewhere else. It also helps with business downtime, so that if your hosting company is affected you can still access files and your site can still run off of its backup servers located elsewhere. Use this month calendar to get the job done. 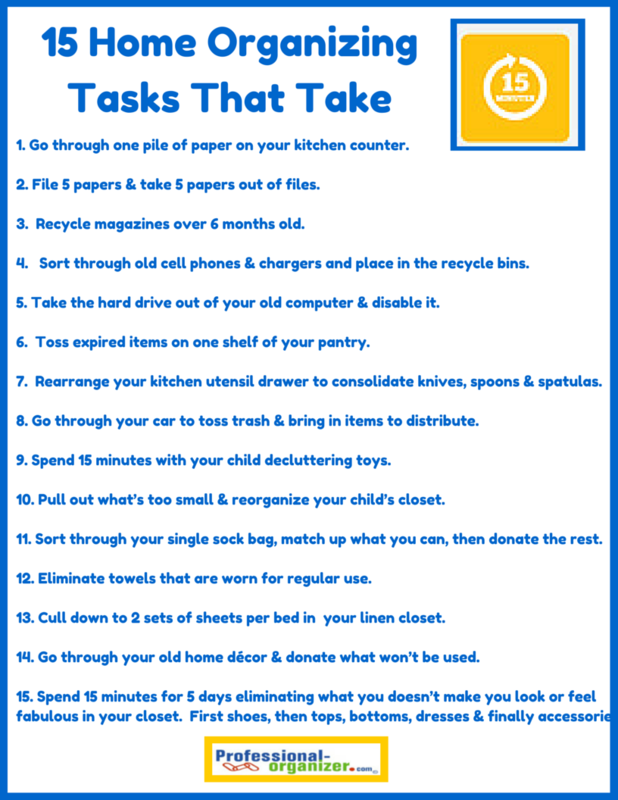 It’s completely paralyzing at times to think how long it will take to organize your home. It seems like every step you take and every room you enter has hours of organizing to do to get it together. But as we know from Lifehacker, there are betters way to get this job done! It can be just flitting from space to space with 15 minutes time slots to organize your home. I am obsessed with organizing in 15 minutes. These 15 home organizing tasks are an easy way to get organized. For 15 minutes you can tackle a lot of paper. Grab a stack on your counter and let it go. Not sure what to keep, check here. Remember that awesome filing system you created in 2001? Get in there and renovate it with 5 files at a time. Cull through and pull out last season’s magazines and be ready to enjoy the more recent ones. Recycle these when you go by to get your oil changed, visiting the doctor’s office or other places where people wait. 4. Sort through old cell phones and chargers and place in the recycle bin. Gather up old technology and delete all your contacts. Recycle or resell your phones. Donate your old chargers because there are others who want extras. 5. Take the hard drive out of your old computer and disable it. There may be more than one computer you need to recycle at your home or office. Your computer can be recycled or donated once the hard drive is out. Take out a screwdriver to get this done and free up a lot of office space. Take a look at the expiration dates and make a decision. There are lots of considerations for out of date food. Take out what you consider expired and toss. Have you recently purchased new cooking utensils? It’s time to divest what you replaced and send it along to donate. 8. Go through your car to toss trash and bring in items to distribute. Our cars need a little organizing too. If there’s a trash build up, grab a bag and get it to the garbage. If it’s items that need to get back inside your home, bring a basket to gather them together to carry them inside. In 15 minutes your child will begin learning about decision making and prioritizing. It’s a great first step to teach organizing. Focus on letting go of 3 toys, making it easy for your child. It makes every morning easier having just what fits in your kid’s closet or dresser. 11. Sort through your single sock bag, match up what you can, then donate the rest. This task is only worthy of 15 minutes. Reuse these socks in the cleaning area, as dog toy, or potpourri holder. 12. Eliminate towels that are worn for regular use. You purchased new towels but the old ones are in there making the linen area look shabby. 13. Cull down to 2 sets of sheets per bed in your linen closet. An uncrowded linen closet makes a lovely sight. 14. Go through your old home décor and donate what won’t be used. Well used curtains? Not matching colors? Loved that back when? It’s time to bless others to bless their homes with this decor. 15. Spend 15 minutes for 5 days eliminating what you doesn’t make you look or feel fabulous in your closet. First shoes, then tops, bottoms, dresses and finally accessories. It’s true! If you would not buy that today, it doesn’t belong in your closet. Taking your closet organizing in baby steps helps you make the most of your wardrobe. You will love this space and you will know everything you have after you organized.